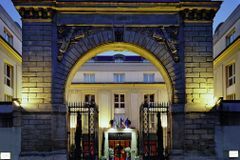 You could be forgiven for expecting a royal welcome upon sighting the Hotel Le Louis Versailles MGallery by Sofitel (formerly the Pullman Chateau de Versailles), a glorious upscale hotel situated less than a five-minute stroll from the Palace of Versailles. With elegant decor, modern equipment, on-site dining and fitness centre - all in a fantastic location - Le Louis Hotel Versailles Chateau is a sound choice for visitors to the region. The newly renovated hotel offers 152 rooms including 11 suites, the atmosphere in the rooms brings eras together, then sets them apart. Clean cut lines and soothing colours encourage relaxation. Particular attention has been given to the work space, ensuring optimal performance.. The new design brings architecture and nature together in harmony with references to the stylised arabesques of the Orangerie, Versailles’ quintessentially French gardens. Cut glass crystal, antique mirrors and contemporary materials. The décor flows from tradition to modernity. The hotel’s wellness area fits perfectly into its surroundings. The restaurant, L’Alcôve, serves the great classics of French gastronomy revisited. In an avant-garde setting with references to the past, the restaurant invites you to discover the delicate flavors of haute cuisine. The bar plays a major role at the heart of the hotel, under the glass roof. Adorned with shades of gold and sparkling lights, this gathering place recalls all the splendor of yesteryear Versailles. The Palace of Versailles and its famous gardens are just a four-minute walk away, and Versailles Château Rive Gauche RER Station is three minutes from the hotel. Secure private parking is possible, subject to availability. The hotel is perfectly situated to access the region's list of outstanding golf courses, including 2018 Ryder Cup venue Le Golf National.